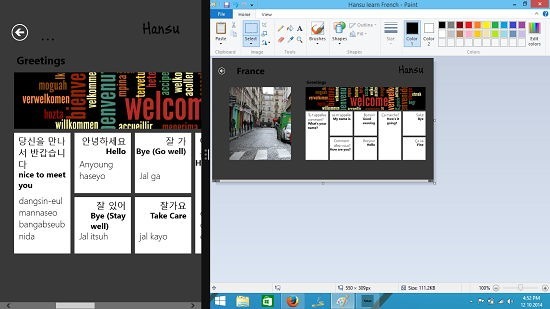 Hansu is a free app for Windows 8 and 8.1 devices which allows you to learn various languages like Korean, French and Japanese. When you launch the app, you will be presented with its main screen which will allow you to select the language which you wish to learn. Although the app will not make you completely fluent and a master of that language, it will still give you a brief idea, enough so that you can actually strike a meaningful conversation with the people who speak that particular language. Hansu is available for free from the Windows App Store. When you install and run the Hansu app on your Windows 8 or 8.1 device, you will be presented with an interface which resembles the below screenshot. Here, you will be able to scroll towards the right side of the screen and see the various languages which are available to be learnt. You can also see the basics of the particular language in small sized tiles. You can open up the detailed screen of particular languages by clicking on their headings. 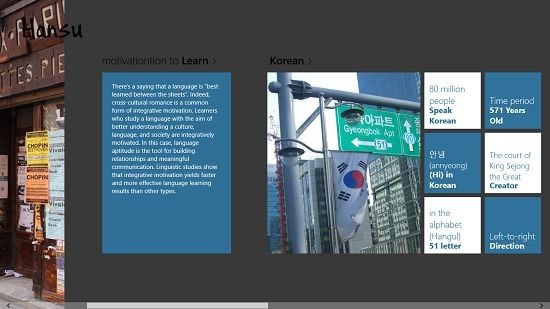 For instance, when you click on Korean, you will be presented with a screen which looks like the below screenshot. 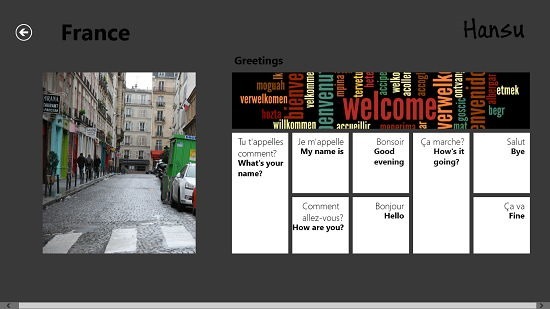 Here, you can see the various tiles which show you the various ways to greet people, etc. You can scroll to read more phrases. Similarly, you can open up a similar interface for other languages like French, etc. You can see the interface for French opened up below. The app allows you to multitask by snapping it to any side of the screen, left or right. You can then continue using it with another metro app or with a desktop app. The screenshot below demonstrates the multitasking ability of the app. Remember that you can always return to the previous screen of the app by clicking on the Back arrow button at the top left corner of the screen. This concludes the main features of the Hansu app for Windows 8 and 8.1 devices. You can also read about the English With LinguaLeo and Learn-e-Language apps for Windows 8 and 8.1 devices. Hansu is a well designed app for Windows 8 and 8.1 devices which allows you to easily learn a lot of language on your Windows 8 or 8.1 machine. The app is a great way to enrich your language speaking skills, or simply if you want to know about different languages and various countries and their cultures. Being completely free, the app is definitely worth a look if you are looking forward to learning new languages at the convenience of your home, and makes for a great download for businessmen, students etc. who have to travel abroad frequently.